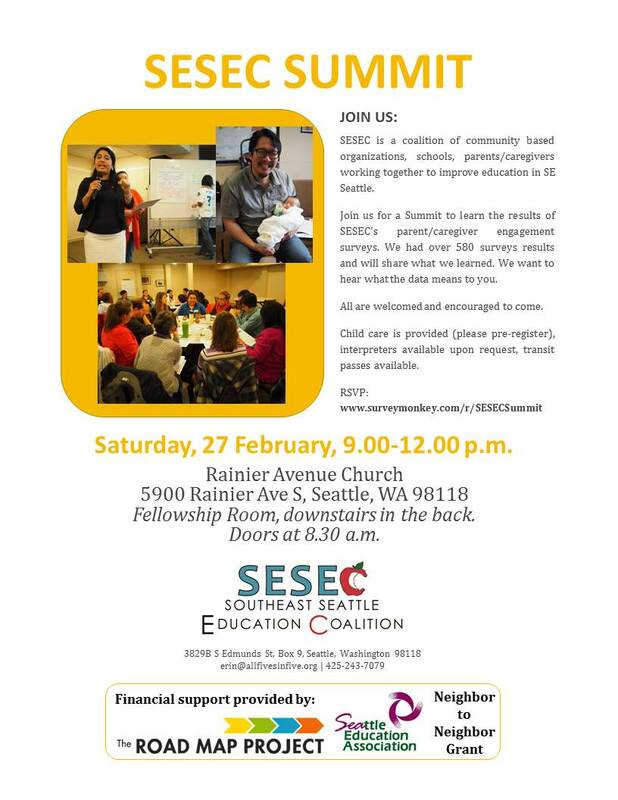 SESEC is hosting multiple events in the upcoming weeks: Facebook Chat with Seattle Preschool Program, a Listening Session with Seattle Public Schools Assistant Superintendent Pegi McEvoy, and the SESEC Summit. See below for more details! Don’t forget to register for the SESEC Summit! Help us spread the word. A flier in Spanish is now available. Check out the final report summaries of the Home Language Campaign Mini-Grant projects and learn about the exciting proposals by Chinese Information and Service Center (CISC), G.O.O.D Girls (Girls Out here Opening Doors), Maple Elementary School, and Seattle World School, that were awarded and implemented in the last few months! Nora Stone Smith Scholarship for ESL/ELL Students. The purpose of the Nora Stone Smith Scholarship is to honor and to give financial support to deserving high school seniors and students who have graduated in the past year and have participated in an ESL/ELL program at some point in their lives. This scholarship is available for all ESL/ELL students, regardless of their citizenship status. Nora Stone Smith was an avid reader and self-educated woman. Education was so important to her that she returned to school to get her B.A. in her late 50s and went on to complete her M.A. in Literature. This scholarship was created by her daughter to honor her memory. This scholarship is available for all ESL/ELL students, regardless of their citizenship status. Award amounts range from $1,000 – $2,000 and can be used at most private or public universities, colleges, community colleges and technical schools across the state. Deadlines for applications is March 30, 2016. 200 African American and Black Men Welcome Students at South Shore K-8. On Monday, 8 February, 200 men of African descent welcomed and “high-fived” students as they entered the school for National African-American Parent Involvement Day. A wonderful way to start a school day and to show support to students and educators of color. Thank you to the organizers and all who showed up. Thank you to everyone who voted and thank you to Schools First for their generous time and work on this campaign. The first round of results are showing that the school levies are passing! Dwane Chappelle is confirmed to be the Director of the City’s Department of Education and Early Learning (DEEL). Chappelle was nominated by Mayor Murray for the position in October 2015; Seattle City Council confirmed his role on Tuesday, 9 February. When: Friday, 19 February from 12.30 p.m.-1.30 p.m. Details: Do you have questions about Preschool readiness and registration? 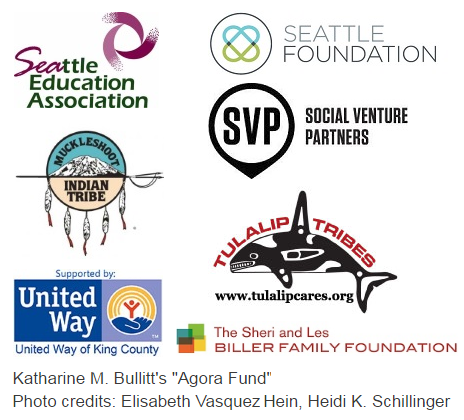 Do you want to learn more about the Seattle Preschool Program? Ask your questions during our Facebook Live Chat! Seattle Preschool Program will be online to answer questions and share information. If you can’t be online during that time but have a question, feel free to leave your question and we will do our best to have it answered on Friday, 19 February, 12.30-1.30 p.m. Please share with parents and caregivers who are looking for preschools. When/Where: Please see this flier for more information. Details: Major Murray has proposed to replace and expand the Seattle Housing Levy, which is expiring at the end of the year. The local investment has successfully created and preserved over 12,500 affordable homes throughout the city. Join City staff and your neighbors to learn about the proposal and provide your input at community meetings around Seattle. During February, we will be seeking public feedback on the Mayor’s initial proposal before he sends the Housing Levy legislation to the City Council. Join us at one of five community meetings, or send your feedback to [email protected] by February 26.